Monster Casino is a fun casino with a lot of excitement to offer. 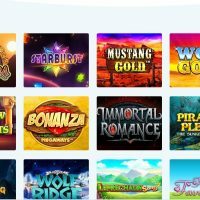 They’ve called themselves the “ultimate destination for playing online casino games and online slots” and despite the name, there’s “nothing here is to be scared of, because this place is not less than a paradise, we have a wide range of exciting slot games to offer with themes that are different and entertaining, powered by an advanced, user-friendly interface for the best possible online casino experience.” That’s a lot! But are they up to scratch? Let’s find out! Monster Casino is powered by Nektan (Gibraltar) Limited and licensed by the UK Gambling Commission and Government of Gibraltar. 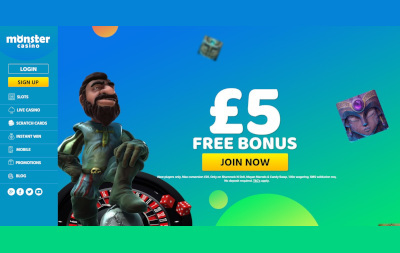 Upon entering the Monster Casino website, you’re greeted with a £5 free bonus offer and our good friend Gonzo taking a break from his quest. Scrolling down you get some more bonuses (including a 200% match deposit bonus up to £50). 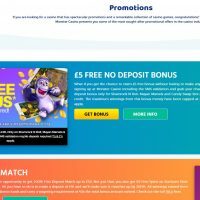 Then a brief selection of the top Monster Casino games (more on those later), some more promos (including that humongous £500 welcome bonus package with 50 free spins on Starburst), app links, and a load of wordage about Monster. Phew! That’s a lot to take in. 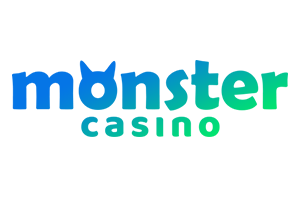 If you’d rather save yourself repetitive eye strain and finger cramps, you can get all that information from the links on the left-hand side. Speed wise, it’s pretty smooth. It’s faster on mobile which is always a plus as most players prefer playing on mobile anyway. All-in-all a great user experience. Monster Casino has all the popular payment methods like Visa, Mastercard, PayPal, Neteller, Playsafecard, GiroPay, and Skrill. The minimum deposit and withdrawal amounts are £10. Withdrawal and deposit amounts are dependent on your payment method (more info can be found on their Terms and Conditions page). Onto the games and there are loads! Over 500 to be a bit more exact. They have slot games powered by NetEnt, Microgaming, and IGT, and amongst them, the titles include Guns ‘n’ Roses, Cleopatra, and many more! Don’t forget Starburst, where you can get 50 free spins when you join with the £500 welcome bonus package! Besides the slots, there are also table games and live dealer games where you can play roulette, blackjack, and baccarat. While there isn’t a reward scheme on offer, you should take full advantage of the promos. Because there are a ton of them available to you now and regularly. I truly believe Monster Casino lives up to its name in terms of offers and games. Just from the home page, there’s a monstrous amount of games and promotions to take in. Not really a bad thing as they’re all part of the fun but it may overwhelm some. 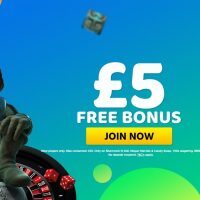 The main features you need to remember are the welcome package of £500 and 50 free spins on Starburst, some of the best games in the business, and to enjoy yourself while you play.